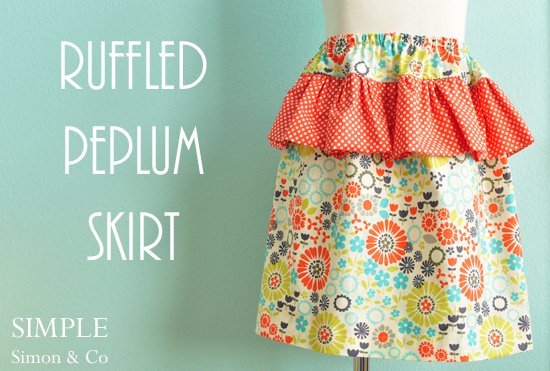 Ruffled Peplum Skirt. A Tutorial. I have been dreaming about this skirt for a couple of months now. 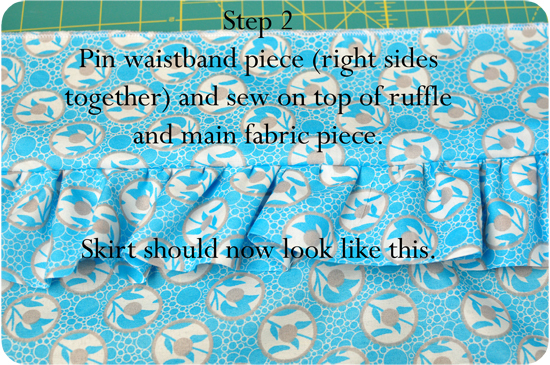 It is part of my thought process of “what to make for tweens” and better yet, it is also one of those incredibly easy skirts that I adore to make. I made a mock-up prototype skirt about a month ago, but didn’t like how short the peplum ruffle part was, so I remade it this week with a longer ruffle and it is exactly what I had envisioned. I am giving you the measurements I used for a girls waist size 5/6 although the length of the skirt is more like a girls size 7/8. 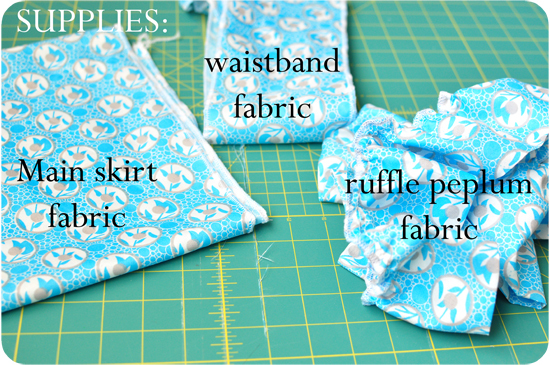 If you need another size….you need to find a length measurement (waist to knee) and then figure out how much of a waistband you want above the ruffle. I made my finished waistband 3.5 inches above the ruffle (plus 2 inches to fold over for the casing), so the cut height is 5.5 inches. 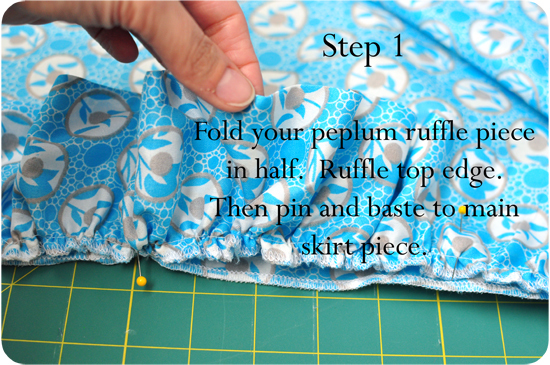 Your ruffle should stay the same, unless you are making the skirt for a teeny tiny girl, then you might want to cut it down a bit. 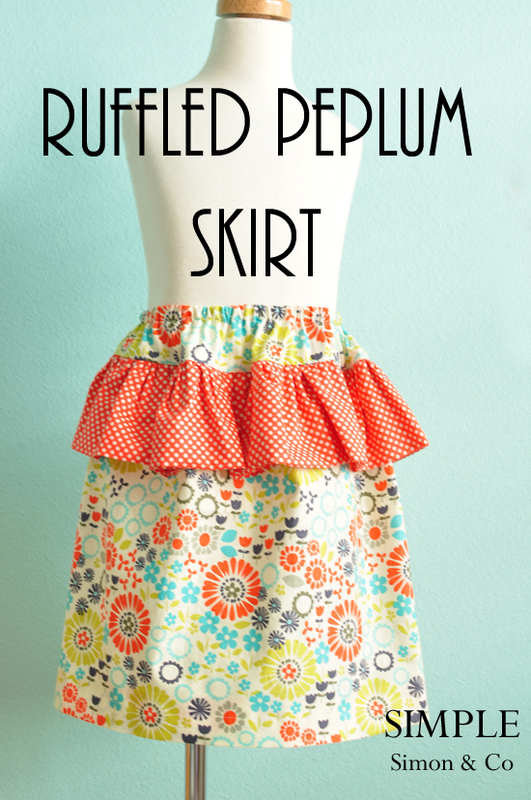 And you have yourself a cute and trendy ruffle peplum skirt! *I think I might make the skirt below the peplum a straight skirt (waist plus 2 or 3 inches) and then add the ruffle. I think more of a straight skirt would be darling on an older girl. 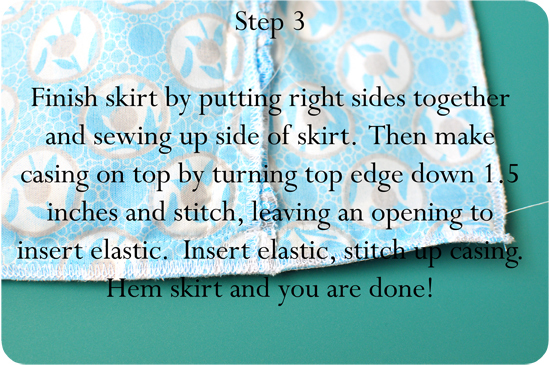 *Or, you could make the front a flat front skirt…and just add the elastic in the back. PS– I have a couple other peplum ideas brewing…..hopefully they turn out?! PPS–My blouse is coming along nicely….phew. 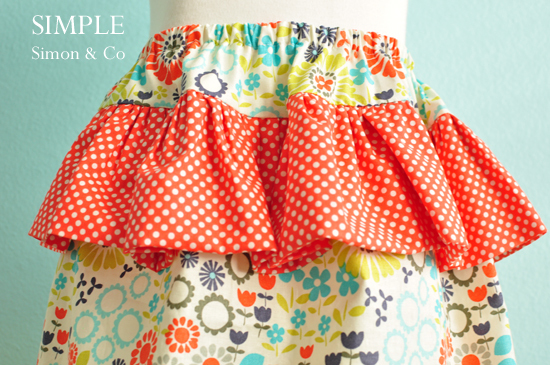 I love this skirt—but I want to make one n Gracie’s size! Very cute! I’m loving those fabrics. I made a skirt like this for Olivia last summer, but I think I made it too long and the fabric too heavy. You’ve inspired me to try it again!! Sometimes, I just give up on a style if I don’t like the way it comes out the first time. I need to make more of an effort to REVISE. That is so cute!! I love the fabrics – can I ask where you got them? how did I miss this yesertday? I love it! What a great idea! Adorable! I used the same fabric (the main fabric) for my daughter’s Easter dress. Thanks for sharing! The main fabric is from JoAnn – I used it recently. I emailed Aurie but then thought maybe more than one of you had the same question. Yes, the quilting cotton is from Joann’s and the dots is from the Verona line at Riley Blake.